Our floor Safety Spot is a warning signal used in areas with poor visibility. Warehouse floor at a five-meter distance in front of the vehicle. When exiting narrow and poorly lit warehouse aisles, pedestrians and lift trucks can frequently come dangerously close to collision. Intersections of racking aisles are notorious accident areas in a warehouse. Accidents inevitably cause injuries. Special safety measures are necessary to protect the employees’ health and allow for smooth warehouse operations. when a vehicle is approaching before they turn the corner and enter a potentially dangerous area. your warehouse safety by preventing accidents. Our floor Safety Spot ensures that your lift trucks are clearly visible for pedestrians and other lift truck operators. Benefits include a higher safety level in your warehouse and a decrease in damages of vehicles and goods, while also reducing the risk of injuries. 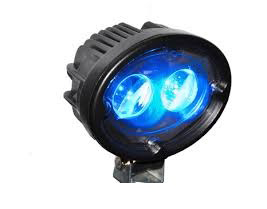 Due to the variety of floor surfaces and visibility conditions, the Fowlers Machinery Safety Spot can be ordered as a red or blue spot beam with an optional switch according to travel direction. The latter automatically changes the direction of the projected light when driving in reverse. The Safety Spot can be retrofitted to almost any fork truck configuration.